Clark's Trading Post and the White Mountain Central Railroad, by Linda Eisenhart, 2018. This historic photo tour tells the story of Clark's Trading Post, the iconic and beloved family attraction located in Lincoln in New Hampshire's White Mountains. 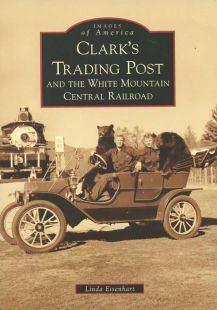 The book covers all eras of Clark's, starting with the Eskimo Sled Dog Ranch in 1928, continuing with the introduction of the bear shows in 1949 and the White Mountain Central Railroad in 1958, and carrying on to the present day, when up to 20 members of the Clark family are working at the Trading Post on any given day. 128 pp., 6 1/2" x 9 1/4."